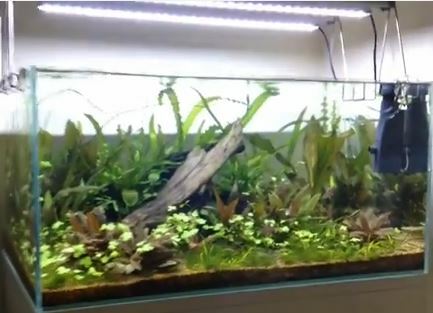 The “Fluval Aqualife & Plant LED Strip Light” is already well known since it is being sold in PetCo and other major online and brick and mortar retailers, as well it has the marketing power of its owner corporation, Rolf C Hagen behind it as well. 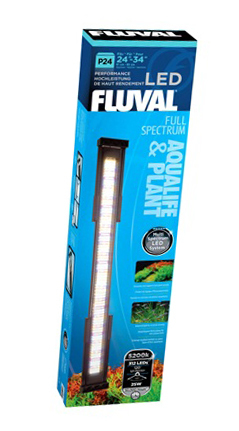 The AquaBar [now discontinued] is sold by TMC, which is also a well established company, but is more well known by aquarium professionals and then for “higher end” products, so this LED light is somewhat of a diversion for TMC in my opinion. Notwithstanding, TMC is also only sold by higher end brick & mortar and online retailers, NOT at PetCos, Amazon, etc. The emitters are non descript generic emitters of different colors to produce a 5500 Kelvin Color temperature, notwithstanding 5500K is not the best kelvin temperature for plant growth. The Fluval Aqualife & Plant LED can clearly grow plants and displays fish colors reasonably well too, however there is little shimmer when compared to high end planted aquarium LEDs such as the GroBeam or TMC Mini 400. A major negative is that since this LED uses so many low end emitters just to obtain a 25 wattage output, regulating voltage CANNOT be done correctly while keeping the price that these LEDs are sold for. The more emitters, the more complex the circuitry to regulate the voltage over each emitter. Otherwise the alternative is simply daisy-chaining lights similar to Christmas lights, and this results in a voltage drop along this “chain” of lights. Since LED emitters are designed to run at specific voltages, life expectancy of emitters will be lower and color spectrums will not be the same. Think about a dimmed incandescent bulb, as it goes from full on to almost off, it gets less white. The end result is a very poor PUR light spectrum with plant growth simply achieved via a shotgun approach, which with this poor light spectrum, the end result is higher algae growth; in particular Black Beard algae and cynobacteria. As an example; only one 12 watt GroBeam is required for a 20 gallon “high light” requiring planted aquarium versus a 25 Watt Fluval Aqualife LED for best results. Interestingly, when one takes into consideration that the GroBeam 12 watt is less expensive than the Fluval 25 watt, has the highest PUR of any comparable LED, and is available with an unlimited 5 year warranty, what light to purchase should a no-brainer. This is TMC’s foray into more economical lighting. As an aquarium professional who has used many of TMC’s products for years, just because they were often the best of the best and built/designed with aquarium professionals in mind, I do not really agree with the reasoning here. The TMC AquaBar model 500 for freshwater aquariums is a 12 watt 50cm (19.7″)LED light strip with (30) 6500k White Samsung LED emitters. Whereas it is not PWM capable as with the TMC Grobeam, it is still run by advanced circuity similar to many other advanced aquarium LEDs that run similar numbers of emitters. The appearance in the water with the more blue heavy with little yellow light energy AquaBar Freshwater LED is more blue than many freshwater LEDs, including the GroBeam. While definitely a step above the Fluval and especially the very unreliable Finnex LEDs, it is clearly a step below the high end GroBeam and Mini 500 LEDs that TMC offers for those seeking the best in planted aquarium lighting based on the science of PUR. Below is the Spectrogram for the AquaBar. Note that lack of yellow light which tends to make this LED appear more blue. This would be a plus since yellow in particular has a tendency to grow cyanobacteria [blue/green algae]. Yellow is much more pronounced in the Fluval LED. In Conclusion; early results shows this to be clearly the best of the economy LED lights, however for me, I would prefer to spend the 25% more to get the shimmer, more accurate PUR, and longer warranty of the GroBeam LED. But for those who need to watch every penny, this is probably the next best freshwater LED with $30 -$35 savings per strip over the GroBeam. This is a subject that is way overdue to be discussed, as aquarium forums often are like our mainstream news media which simply repeat information, whether accurate or not that fits their template. Often with intentional miss-information based on broken links by moderators after members provide said links such as to this website or even taking down of legitimate questions by members such as I witnessed as the Chicago Reefs forum (based on a forwarded email for a aquarium maintenance & research professional). Similar comments have been made about Fluidized Sand Bed Filter versus wet dry filters even though the FSB filter is clearly the better technology for planted freshwater aquariums when simple science is applied. It is also noteworthy that FSB filters AND TMC AquaRay lights ARE quite well known and used if you search beyond an aquarium forum. Another common problem is since search engines often give “authority” to websites or forums posts based on age, often what comes up in forums or Yahoo is simply out of date information. Some of these outdated posts may have been correct at the time, while others have been proven incorrect as science has progressed. Thankfully the Internet is not 100 years old or God knows what in terms of bs would be argued as fact based on someone reading an outdated forum article! Back to sponsorships/marketing and how different marketing methods have a direct bearing on what will be seen/read on a forum or not, as some companies use a different approach to marketing that does not involve forum sponsorships. TMC for instance placed an emphasis on getting their product in the hands of aquarium installation professionals rather than forum sponsorships with the exception of a popular UK forum. What readers should understand, and frankly this is not difficult for those with an open mind and have not drank the Kool-Aid so many forums serve, and that is these “outside the box” products are NOT going to be featured in ANY forum, even though they ARE popular among many who are not active in forums or other social media. My clients are very private and refuse me to publicize any of their aquariums in pictures, even for a resume, so my referrals are all by word of mouth (I currently am not taking new clients anyway). This is not all that unusual and in fact as an example from a story my mentor in the business told me about how once he was setting up an acrylic aquarium with tubes between two tanks and he brought his then wife to this executive office waiting room. She really could not help much at the time so she quietly sat on the couch . However soon one of the executives that worked there told her she had to leave, my mentor tried to explain, but he quickly told my mentor how important the privacy of their office was and that he needed permission to bring anyone other than himself. My point is this is typical of how many view their aquariums maintained by these professionals, so you are not going to see many of these aquariums running AquaRay LED lights, FSB filters since these have never been really pushed or made it past the Kool-Aid gate keepers at many aquarium forums. What is also unfortunate that even with this shroud around aquariums set up by professionals using these products, there is still ample information and pictures in websites such as this, Youtube, Facebook and other locations. Part of the issue or so it appears, since I am actually relatively new to being “active” on the Internet is the point that Google is not all that good in bringing up many science based websites , rather is heavy in many social media such as forums or big box websites such as Dr. Foster or Amazon. I personally use Bing though for my searches, while I have a friend who swears by DuckDuckGo.com for internet searches. Although the purpose of this post/article is to explain to those who only read forums or cannot get past page one of Google that there IS PLENTY of information for those willing to do even the most basic of research, I will make some brief explanation of products that often get the cold shoulder in these Kool Aid serving forums. Wasted Heat energy; this is science 101 that any energy that is being dissipated with fans is energy that is NOT going to light energy, thus requiring more wattage for the same results. If you see a fan or two blowing, you know that this is extracting heat. As well PWM, while more complicated also plays a role in this wasted energy as well as potentially changing the spectrum and thus wasting even light energy outside of the best known PUR. Utilizing green emitters and other emitters (including warm white) that are known to emit light energy outside of what is optimum for corals and other photosynthetic life forms. 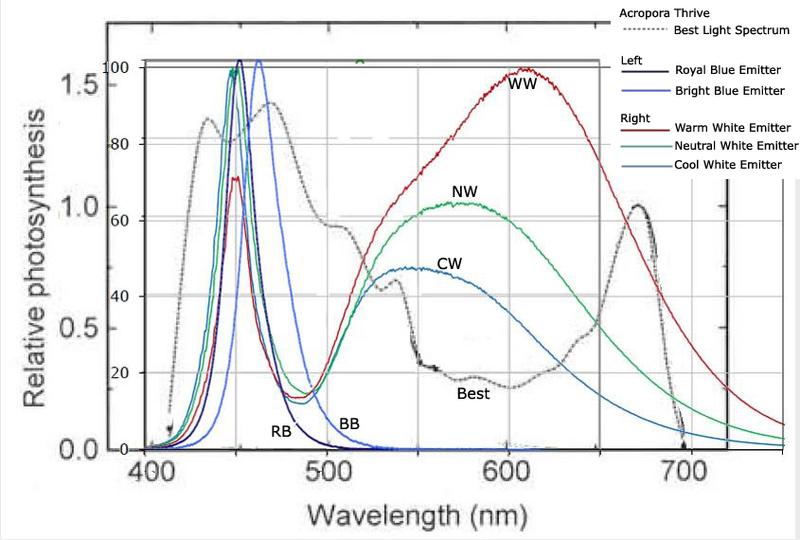 While photosynthetic life can generally use most all light within the PAR range, it is fact that certain light spectrums are much less efficient and provide different aspects of photosynthetic response. Heavy dependency on PAR meters, even though it is a fact that even a PAR meter is more accurate in the middle ranges, thus giving a green light a higher PAR value than an actinic blue, even though the blue is going to have a higher useful PAR and thus is higher in PUR. As well, statements by some that absurdly high PAR numbers such as 500 µMol•m²•sec are required by Acropora, when in fact a study at a Coral Farm in Bali showed no more than 200 PAR from noontime tropical sunlight at the depth the Acropora were being grown. These numbers may be true for some poor PUR lights that are heavy in green, yellow, etc. light energy, but not those with better PUR spectrums. Warranties; while this is not a scientific argument, it is one of simple logic and that is why would a the so-called superior LED light only have a warranty of 1 year while the so-called junk LED have a warranty of 5 years? This is a real head scratcher, yet forums such as Reef Central or PNWMAS will actually bash the 5 year warranty lights over the 1 year warranty lights!! Part of the problem with these shorter warranty LED lights is fan malfunction. The fans on some LEDs will malfunction in a couple of years (or less), resulting in over heating of circuitry and total failure of the LED fixture. Below is a reef aquarium I was given permission to share utilizing ONLY AquaRay NP 1500 & 2000 tiles. These really are not all that new, with many large commercial operations running these filters. What might be more new is the design, with better models such as the V2 Bio by TMC now available than what was the industry leader 10 years ago, the LifeGuard. What sets these filters apart, especially for marine or planted aquariums? With Wet/Dry filters, in particular, these will strip CO2, often resulting in the need for expensive pressurized CO2 units, that are often not required with FSB Filters. With marine aquariums, the V2 FSB Filter can be run with optional Oolitic sand which then works similar to a calcium reactor in maintaining calcium, pH, and alkalinity with less additional supplementation. As well these can be set up to control and remove nitrate with a tall enough filter such as the V2 #1500 and use of products such as American Aquarium NPX Bioplastics. This is too long a topic to address completely other than to state that there is good evidence that a UV Sterilizer does not just control disease by virtue of level 1 or 2 UVC sterilization, but by improving the Redox Balance than thus allowing fish to fight off diseases with their own improved immune system better. What many miss based on conversations with clients and others is they go and purchase some piece of junk UV clarifier that CANNOT ever perform level one UV Sterilization. Unfortunately many of these so called UV Sterilizers abound from the Green Killing machine to the many AquaTop UVs. Then they see poor or no results and make blanket statements in forums that UV sterilizers are only good for clarification. Another common issue is purchasing low UVC output UV replacement lamps on eBay, Amazon, etc that only produce 7-14% germicidal UVC light energy instead of a true level one low pressure UV Bulb that has 5 times the output and in the end make claims their UV sterilizer is junk. Misinformation also abounds when it comes to the discussion of high end UV Sterilizers and which are best and what they can and cannot do for your aquarium. This is where the anecdotal but unfortunately popular forum “Reef Central” is often at its worse. I have read many posts my customers or other service guys have sent me where this forum personally attacks those with actual experience and science based expertise rather than deal with the science. 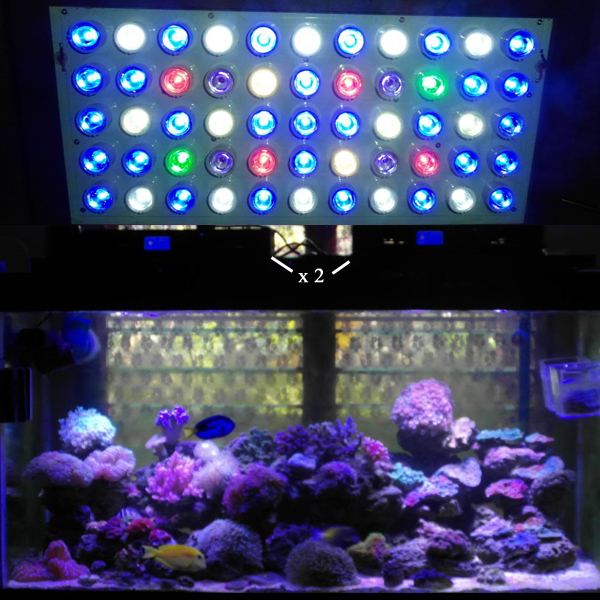 Similar to their Reef Police moderation when it comes to LED aquarium lighting. I have read where high level members/moderators will bash TMC UVs while promoting Aqua & Emperor UVs. As someone who also has used all three, I can state that they all are excellent premium UVs, but to trash the TMC, which seems to be the brand they love to trash, shows the lack of character and honesty that goes on at Reef Central. As an example, one argument they have used is that only Aqua & Emperor provide a good supply of parts and good customer service. However TMC does as well and my experience with obtaining parts and service since retailer based versus manufacturer based is much better with TMC. I could go on, but that is not the scope of this article, all I can say is to read anything at Reef Central with a grain of salt. The Myth of Stress Induced Betta Tail Biting. “This seems to have sprung from popular Betta keeping forums, just as the made up (myth) of s fish disease: “Red Pest”. Unfortunately just as in “Red Pest”, this myth has grown wings in re-post after re-post to the point many now believe this actually happens when in reality there are better explanations for the damaged tail or behavior Betta keepers think they are observing. For starters, biting of ones self when it has some sort of irritation (itch, stress, etc.) is a warm blooded animal phenomenon. You will not see a lizard, fish, etc. biting itself. Rather you will see these animals scratching against a rock or similar due to irritations. This is more commonly known as “flashing”. However, it is quite common for a bird or dog to literally decimate themselves over irritations or stress. Stress decimation has never been proven in cold blooded animals. Every other YouTube video is someone assuming their poor Betta is biting their tail, many showing Aeromonas and not treating for the real problem. This is how bad this myth has spread!! Yet, even with these facts presented to them, a few aquarium keeping groups such as the otherwise intelligent “Fish Tank Enablers” continue to push this myth. Aqua Ultraviolet versus TMC UV Sterilizers, Reef Central; THIS ONE IS A MUST READ!! In this article, I will interview a couple of lessor known, but growing in popularity Aquarium LED light fixtures due to a Northwest aquarium forums promotion of these Chinese fixtures. These are all made in the same Chinese factory with simply different names. The Ocean Revive/Evergrow utilize better drivers than many Chinese made LEDs and are also reef capable, but at nearly 2-3 times the energy wattage input as required by a top aquarium LED (120 watts versus 30 watts for the same PUR). What is interesting, is the owner of Ocean Revive claims: “the prototypes were built in the garage and tested on our own tanks”. HOWEVER the Ocean Revive and Evergrow are the same LED; don’t believe me, give them a close up look!! The draw back to these LEDs is that they utilize current reduction technology, which can alter spectrum. This alteration produces much more excess heat than the better, but more expensive PWM technology. Hence the need for cooling fans. All Aquarium LEDs that utilize ‘current reduction’ will require a fan. The straightforward scientific FACT is that this excess heat represents energy that is not being used as light energy for your photosynthetic life. Take an ordinary incandescent light bulb and place it in a socket with a common dimmer (which would be current reduction), then to slowly dim the bulb. As it dims it is quite obvious with the human eye the that color spectrum changes. While I will admit my experiment has flaws, we do know that LED emitters are designed to run at specific voltages for the light output they were designed to produce, so it is not too much of a reach to draw some conclusions from this experiment. 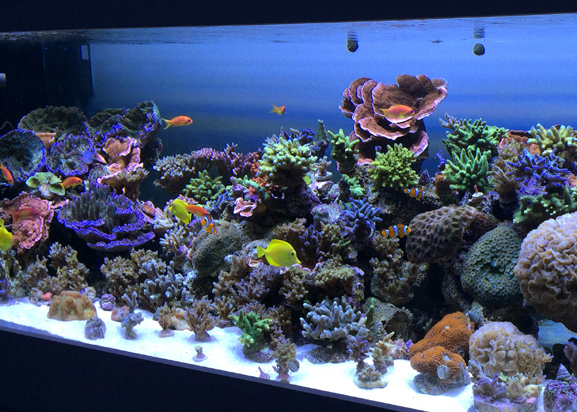 Another issue with the Ocean Revive and Evergrow Aquarium LEDs is their use and choice of emitters by Bridgelux. These are inferior to many of the patented emitters from Cree and Osram Olson, used in higher grade units. Now let’s look at a graph that plots some of these same emitters along with currently scientific known needs of an Acropora coral. Once one realizes according to scientific facts, it is obvious that the light spectrums miss the ballpark of spikes required by photosynthetic life within PAR. In other words the VASTLY more important PUR. Unfortunately many LEDs including the Ocean Revive/Evergrow, will produce great PAR measurements, however it is not rocket science to realize that a PAR meter ONLY measures light energy within the 400 to 700 nanometer range. So, while one light might measure a higher PAR mmol reading, another light might be still superior due to the more important PUR output. These spikes fall around the 410-500nm and 630-670nm, which you can see from the above graph are considerably missed by the emitters used in these LEDs. THIS REPRESENTS WASTED ENERGY! Your PAR meter might measure this light energy, but your photosynthetic life will NOT!! Now let’s look at the warranty of the Ocean Revive & Evergrow Aquarium LED Light. These are only warranted for ONE YEAR. Compare this to the industry leader that is for 5 years for the fixture. Why is this extreme difference? Well, this is where I will venture from scientific fact and offer an opinion. The Industry leader, TMC AquaRay, utilizes the vastly superior driver technology, which produces much less heat. This heat is destructive to LED units and frankly, breakdowns of cooling fans is a known issue with most brands that utilize cooling fans. “Problems with the Ocean Revive/Evergrow include issues with “burnt diodes”. The problem is primarily with those in the range of 450nm & 420nm. Since these are a generic diode made in the same Chinese factory that builds many popular, but lower cost LEDs, this problem may be more widespread than we know. Finally; one forum in particular has promoted the Ocean Revive, with claims that for an inexpensive LED, it grows SPS corals well. Well this is true and the results certainly speak for themselves. However they do it at a higher than needed electrical cost and for a fixture that does not have an IP-67 waterproof rating along with a very short warranty. What is worse about this forums promotion of the Ocean Revive is their lack of honesty in comparing to the higher end TMC AquaRay. Stating a 30 Watt Reef White NP 2000 is under powered when compared to an Ocean Revive at 120 watts is a no duh!! The larger Ocean Revive has a larger footprint and many more watts input energy. Try comparing four of the 30 Watt Reef White NP 2000s and you will quickly have much more light energy and a larger footprint for a fixture that is VASTLY more durable and safe in a wet aquarium environment. Of course not this many AquaRay fixtures is needed to make a comparison, as two AquaRay will generally compare to the Ocean Revive. The other false piece of information [based on feed back from a friend in the industry] coming out of this forum that is clearly promoting the Ocean Revive [the seller is a popular member there too], is that the TMC AquaRay has no proof growing out sps corals. This is either ignorant misinformation or a blatant lie. Either way the AquaRay has been around years before the Ocean Revive with many updates since. The AquaRay was growing sps corals for years before the Ocean Revive was on the market. This includes the largest seller of quality fish & invertebrates in North America and Europe, SO DO NOT FALL FOR THIS CRAP!!! It is quite obvious that the Ocean Revive and Evergrow are far from the best when science is applied, not marketing. This does not mean these cannot keep marine life, as I know for a fact these LEDs can. However, why spend less now to require as much as 3 times the electricity over the life of the LED to run these LEDs, where is the energy savings over a Metal Halide? As well, when you consider these light may not last more than 2 years or even less, before requiring repairs or even replacement. Your so-called savings is not just out the window, it has circled the globe a few times. In the end, you can choose to believe the many lemmings in some forums that would have you believe that the Earth is flat, or you can look at the science. Since I originally wrote this post, based on a clients suggestion, I stumbled upon a recent thread (as of January 2014) in a reef keeping society forum that was troubling. In this thread, many, including what appeared to be moderators were dogging what I assume was one of the sponsors of this forum and asking for proof of a track record of the Aquaray versus lights such as the Ocean Revive! All I can say is REALLY?? This is both dishonest and insulting since so many professionals such as myself have used Aquarays for many years now and it is the Ocean Revive/Evergrow, that is the new Chinese based brand on the market with much less track record other than heavy reef forum and club sponsorship, in other words buying club members off IMO. One person even dissed Quality Marine USA who is a livestock supplier I know well and buy from. In “Quality Marine” you have arguably the premier livestock wholesaler in North America, that also uses many different pieces of aquarium equipment to keep livestock alive in long term display tanks to prove their quality over many of the wholesalers (that will go un-named) who sell primarily to retail stores where price is more important than quality. Why would they use equipment, including lights that will not do the job of keeping up their primary business (livestock)?? The lack of logic, from simple to scientific in this forum was utterly baffling to me. Aquarium LED Warranties;this is a something I have heard a lot of lately. I believe this idea of warranties is called into question is because of the plethora of Aquarium LEDs sold that utilize poor drivers and cooling fans. This is all due to poor design that are now breaking down. This break downs cause issues. I know someone in the business who have had fires when their cooling fan malfunctions (TaoTronics and EverGrow are a couple that have been noted). For me, it has just been the cooling fans breaking down. EcoTech Radion broke down after just a year or so of use. This is important because so many persons bragged to me or friends about their great price on many Chinese LEDs, but they never factor in that it takes usually twice the electrical wattage to produce the same output in useful light energy. They never question why these LEDs have a fan. Many of these LEDs, such as the Evergrow and Taotronics, utilize 120 watts to produce the same PUR light energy (not to be confused with PAR) as the 30 watt top notch European models I now mostly utilize. When you have high PUR/PAS [useful light, photosynthetic action spectrum] emitting diodes, you don’t need a fan because there is no extra energy that is converted into heat. No hot heat, no fan needed. Readers, please take note that many of these lights are sold under different brands and therefore are lumped together. This warranty says a lot about this product! Problems with the Finnex include the “Planted+ 24/7 IR sensor” which has gone out for many users of this product. Other problems include the Finnex Planted+ over heating and condensation failures are quite common. As well, Finnex will void the warranty if it appears the light was not placed ON some type of cover and was directly over the water!. Unfortunately for many aquarium keepers, this is how they mount their lights. The bottom line is despite many forum recommendations, this is a nice looking planted aquarium capable light that is not built to last and should only be considered if “cheap” is all that matters to you. Problems with the Current Satellite includes moisture builds up inside of the light, which eventually causes failure. Unfortunately most reports of this occur after a year, thus after the one year warranty. Problems with the Ocean Revive/Evergrow include issues with “burnt diodes”. The problem is primarily with those in the range of 450nm & 420nm. Since these are a generic diode made in the same Chinese factory that builds many popular, but lower cost LEDs, this problem may be more widespread than we know. Heat problems also exist and may be what contribute to the diode issues. These fixtures seem to be especially problematic when placed in a canopy or close to water. The LED Clusters have a two year warranty for replacement, but this means the owner must wait for repairs and any a possible labor charges. While I have not sent in an EcoTech LED under warranty, I know of other aquarium service persons and store owners I trust who have. While warranty issues are rare, time to wait for repairs can be long. This said, I know of EcoTech working with an owner over issues outside of warranty too. Basically a re-branded Evergrow with upgraded heat sink & more powerful emitters/optics including UVA as well as a better warranty (compare to Evergrow D2120 LED). The same heat issues [even with improved heat sink] and lower quality emitter issues exist too. Still VERY LOW efficiency. Even more questionable is simply the amount of heat these over driven LED lights produce making these comparable to many Metal Halides in potentially requiring a chiller during warmer months. Back to efficiency, this is also major question mark as per this very low quality Chinese fixture, as the SB Reef Light LED has one of the lowest efficiencies of ANY aquarium LED light fixture requiring .41 watt of input energy per 1 point of PAR. Compare this even to other low cost/quality LEDs such as the Finnex which is .24 watt of input energy per 1 point of PAR. 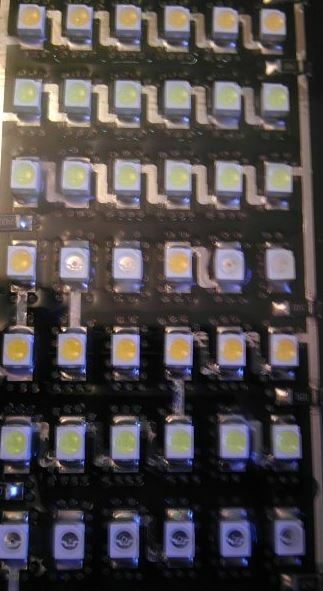 Although well marketed to a gullible non-reading social media market that lives & dies by the meme, these Chinese LEDs are nothing special and are probably worse than most long term because of the eventual heat damage. Quoting a professional friend in the industry; “the marketing and sudden popularity of the Chinese made SB Reef Light would make PT Barnum proud” [“There’s a sucker born every minute”]. These are a laughable aquarium LED when one just uses common sense and when one thinks about why LEDs became a popular alternative in the first place to MH and other lights. Even with the better warranty, not a recommended LED light for those looking for efficiency and quality of build that will last, but nice looking for color, crazy high power, and cheap up front purchase. WARRANTY: 3 Years, however failure of less than 5% of emitters is not considered a defect which can cause spectral quality failure due to poor voltage over other working emitters. Replacement or repair at company discretion. A better warranty than many, however it still daisy chains many low power, no-name emitters together, resulting in very low efficiency. Like the Current Satellite, the Fluval LEDs tend to suffer with moisture build up that eventually causes failure. Easily the worst aquarium LED you can purchase, with a watt to micro mol of PAR efficiency as low as 2.70 watts per micro mol of PAR. Compare this to most medium quality fall around .40 to .50 watt per MM of PAR. With the better models under .3 and the AquaRay line as efficient as .08 watt per mm of PAR. WARRANTY: Limited 3 year for free repair or replacement, however failure of less than 15% of emitters is not considered a defect. Currently BML is no longer manufacturing LED lights for aquarium use, however they still are honoring warranties. This includes for a common problem of silicone coming out from the sides of the fixture due to heat issues (which are unfortunately common with this fixture and its inefficiencies). In fact, as time is progressing, the BML seems to be showing some serious flaws in quality of build, so while no longer built, I would also not recommend a second hand BML from Ebay or elsewhere. The fact this company was never an aquarium supply company is showing if only due to failures since the BML never utilized an IP67 water resistance rating. This has allowed for premature failure of circuitry/drivers. It is the opinion of this author that this is a major reason for their sudden exiting from the manufacture of aquarium lights. I speaking with others, while the warranty period is short for such an expensive aquarium LED, their customer service is great during this time. One down side is these need regular cleaning of the vents/fan otherwise over heating can be problematic, however these LEDs do have a power down feature if they over heat. The other problem the Kessils tend to experience is flickering or randomly not turning on. Kessil customer service is great about correcting the issue with a NEW LED. However you are out of luck if this starts happening only one year or later out. WARRANTY: 5 Years fixture, 2 years power supply. Usually replaced with a newer generation LED Fixture, no waiting for repairs. The AquaRay has a water resistance rating of IP67, among the highest in the industry. Use of PWM also assures less where & tear when being ramped up & down with a controller. Highest efficiency as measured by input energy in wattage to micro mol of PAR by “light years” over all other aquarium LEDs with an efficiency as high as .08 watt per mm of PAR in the AAP Reef White NP 2000. I can state from hands on use and observations with many different LEDs and knowledge from friends in the business, the LED fixture with by far the best warranty and fewest problems is the AquaRay. I’ve personally had a couple of TMC AquaRay GroBeams loose an emitter after a couple of years, but the company replaced them no question asked with a NEW later version of the fixture!!! This did not happen with others I’ve serviced. I’ve had to wait for repairs and a few times the damage was after the warranty period. What is also interesting is that my supplier told me that most returns of the TMC had clear evidence of misuse, YET he told me that TMC authorized replacement with a new fixture anyways! Then you have LEDs such as the “Fluval” which limit warranties to a certain percentage of emitters much be out before the warranty can be utilized. This is analogous to purchasing an automobile with an 8 cylinder engine that can only be serviced under warranty if 2 or more cylinders fail. As of a revision in 2016, I have taken on a new client that already had a beautiful planted aquarium that was set up with Finnex Ray2 lights he purchased in late 2014. Both lights did a nice job, although the colors were a bit off in my opinion, however shortly after taking over this contract this winter a couple of them failed and being the warranty was so poor, these were a total loss after just a little more than one year of ownership!! My thoughts is that this comment by Finnex might be true, as besides the poor 6 month warranty, these poorly built lights have no real water proof rating. In the end, you get what you pay for with a Finnex LED, a cheaply made LED that can most certainly grow plants as long as it lasts. The above resource has an incredible LED comparison chart that is REALLY worth checking out! Amazon is sometimes NOT an honest place to purchase aquarium equipment from or at the very least a not a good place to purchase aquarium equipment and expect to support those in the hobby/industry dedicated to good research, information, and cutting edge products. At the very least your purchase via Amazon does NOT support small to medium size businesses and expect them to be there in the future to help you or provide innovation!! Amazon sells equipment from the same manufacturers as more knowledgeable aquarium supply outlets, HOWEVER they often sell stripped down versions that often render the product useless for what it is deigned for. Examples include the SunSun Submersible UV Sterilizers that have NOT been adjusted for the CORRECT flow rate for level 1 sterilization. None of these include the important pre-filter to lower turbidity inside the UV, making more efficient UV sterilization. Another product is the SunSun Canister filters (303B, 304B, etc.) which are NOT sold by Amazon with the necessary filter media or retrofits of the connecting pieces which prevent a leaking filter later down the road. This filter is one I have clearly seen the differences and why it should ONLY be purchased from reputable professional dealers. This could be said for many other products sold on Amazon. When you get your information from a brick & mortar store, or some of the few top notch aquarium information web sites such as “Aquarium/Pond Answers”, then purchase on Amazon, you not only are hurting small business, but you are stifling the growth of innovation, good service & information. Many of the better products for your aquariums come out of small business research since these guys/gals are generally much more involved in the hobby in a hands on and research sort of way. Products line such as TMC AquaRay & FSB Filter, AAP Wonder Shells, and Clay Neighbor’s Custom Fish Foods are all good examples of lines of top quality and/or innovative products that would not exist if all your purchases for aquarium products were made via Amazon. Amazon sells products that clearly are not what they are meant for. Example here would be the Green Killing Machine. It’s sold as UV Sterilizer when in reality it CANNOT maintain level 1 sterilization and thus is ONLY a UV clarifier. Often so called UV Sterilizers are sold with the same model number but are missing critical parts such as the pre-filter sponge resulting in high water turbidity, resulting in low UVC exposure. Also many of the Amazon UV Sterilizers are sold with medium pressure UV bulbs instead of of low pressure UV bulbs, which cost considerably less, but also have only a fraction of the UVC output for true level one sterilization. Frankly only a fool would purchase a UV Sterilizer via Amazon, as odds such a person would likely get a UV clarifier at best and often it is a piece of equipment with a short lifespan too! Amazon will use whatever listing is first made to represent all future sales of a given product. This means, no matter how inaccurate, misleading, or simply lacking proper information to better educate the future buyer, the information WILL NOT BE CHANGED! Most manufacturers of “high end” aquarium LED fixtures will not even sell on Amazon! YET, by reading reviews of low end LED fixtures sold on Amazon such as the Fluval LED and Current Satellite one might think these were great lights, which even remedial investigation shows these lights are NOT as their PUR is poor at best. The problem is since there is no comparison to LEDs that reflect optimum known science in aquarium lighting as well as the anecdotal natural of most Amazon reviews, one cannot get a real scientific assessment of what is best to get if in the market for LED aquarium lights. Amazon provides poor product support for correct directions. Since Amazon relies on community driven reviews and no true knowledge of the product. Often products are sold with customers purchasing the wrong unit for their aquarium. Amazon uses unfair trade practices including not paying the hidden fees that all small business pay when shipping including paying carbon taxes. In fact as of 2017 via a UPS representative of a friend who ships via his small business, UPS has greatly increased dimensional weight (often doubling some larger box costs to small to medium shippers). What has this to do with Amazon? The facts are Amazon has set agreements with the only two shippers of note [FedEx/UPS] where they pay a flat fee so that Amazon can ship as efficiently as possible utilizing often over sized boxes filled with air pillows and not pay any extra for dimensions, etc. This has resulted in losses for UPS/FedEx which have recently decided to pass this on to their small to medium shippers. The result is every time one of these shippers ship a box of much dimension at all they are subsidizing Amazon so that Amazon can provide low or free shipping. I ask any person with integrity; HOW IS THIS FAIR?? So any time you purchase ANYTHING via Amazon, some other non related business is subsidizing your purchase. If this does not bother you at all, well I guess you have no morals whatsoever!!! As well Amazon allegedly violates monopoly laws and the DMCA laws in use of copyrighted material. Amazon also uses Black Hat SEO methods to further push out small business. In the end, regardless of price, everything you purchase from Amazon something you could have purchased from a professional seller, you are further eroding innovation, true knowledgeable customer service, AND MOST IMPORTANTLY, you are insuring that on products that can compete in a discount environment will all that will be left such as junk sponge filters instead of 4-5 times the bio load Sponge Filters such as the AAP Hydro Sponge. As per the Hydro Sponge Filter, these are NOT authorized for sale on Amazon and as from feedback from others in the industry, most of these sold via Amazon are clearance and sometimes missing parts. As well most models such as the excellent professionally recommended Hydro Sponge Combos are not available at all via Amazon. Casualties already include Aquatronics, the leading innovator of aquarium and pond fish treatments that to this date no company has come close to this companies products leaving many holes in good fish treatment products. THINK ABOUT THIS NEXT TIME YOU ATTEMPT TO SAVE A FEW BUCKS BY PURCHASING FROM AMAZON!! While the title of this article is about why one should not use Amazon for their aquarium/pond supplies. Even worse though, is to not use their community generated reviews which are horribly inaccurate. The reviews are often based on a one time use of the product, often incorrectly based on lack of time, lack of controlled testing, or incomplete parts. As well science such as PUR in lighting is never even mentioned. My observation is based on continued use, often in controlled comparisons, correct installation, and suggestions from other professionals in the aquarium keeping field. I should note that the reason for this post came from an email thread that was forwarded to me by another pro in this industry. This began when a ‘friend of a friend’ and I were astounded at the person who sent the emails. They had lack of logical thinking or integrity in his thinly veiled compliments that were in reality attacks on the person receiving the email. I was so taken a back by this email thread that I quickly asked for and received permission to comment publicly on this email thread. Frankly after reading the entire thread a couple of times I wanted to vomit as to the senders total bully BS and more. The person writing; James W, starts off with disguised compliments, then questions the review of the AquaClear by author who wrote in the thread, with words such as “perplexing”. He based his opinions on his use of ONE Aqua Clear. Since I know of the author and I too have used dozens of these filters as well, I can vouch that this filter does have a higher than average problem with the impeller. Which James was perplexed why the authors noted there of its higher than normal failure rate. The author who brought this to my attention was making additional suggestion, which James also didn’t like. He started to make other complaints, but was confused based on Amazon reviews. The author was clear with the information he used to back up his claim, but James never did look at the references provided. This is just one case where reviews from Amazon got the best of people. As a user and wholesale purchaser of the Rena Smart Filter, I can also state categorically that the reviews over at Amazon are totally off base, but then Amazon irresponsibly sells these filters without the proper knowledge and parts that is required. The email sender goes on about the costs of purchase. Well, since I and a number of other persons know the costs not only to the retailer, but to the wholesalers such as Central Pet. The facts are that Amazon is selling below cost and more importantly below MAP pricing (manufacturer agreed pricing), which tells you a little about Amazon’s honesty. Then, reading how the Amazon CEO treats his employees provides, anyone with any morals, can even more have a snap-shot of why this is not the company to purchase your aquarium/pond supplies from. More importantly, which went right over Jame’s head is, Amazon is 100% community driven, with no expertise at all in what they sell. I know from the numbers that many high end retailers could cut their staff by 75% and still sell, but then not provide any of the free information and intense product support that they do. This is why sellers such as Tropic Marine Centre prohibits their retailers from selling through Amazon. No real support. This James fellow (email sender) has the audacity to get offended by the email recipient for calling him out for his many purchases of products such as SeaChem Matrix based on his free advice through Amazon rather returning the favor via his website. The sender also seems to think the recipient is too stupid to figure out if he spends his valuable time answering questions he already addresses in his articles that he will then finally purchase a filter he claims is already sold at too high a price via the high end aquarium supply retailer. REALLY??? Everyone I have already spoken with who have read this email thread were quite taken aback by this guys at first disguised and then blatant rudeness and moral cluelessness. The FACTS ARE Amazon does not sell this product (Rena Smart Filter) with the correct equipment to work properly, so how can you expect an accurate review. Yet, James seems to think he is entitled to very thorough personal explanation on filters, so he can likely then go back to Amazon and purchase!!!! This guy is a real piece of work!! As the email recipient correctly pointed out, if everyone behaved as this guy does, their will be no accurate, science based information in the future. In the end, every thing will be community driven with no real knowledge. The analogy used in the forum thread was analogous to reading all your medical information at Amazon or Yahoo Answers and then purchasing at Amazon for your medical needs (including your surgeons/doctors). God forbid if this bully/clueless individual every had cancer in such a world where Amazon & their terrible community reviews is where he would have to get his cancer treatment. Unfortunately though, with people thinking and purchasing as this person does, this is the world we are coming too. The email senders final comment: “So, it is ok for you to be condescending, but when someone takes offense you don’t like it. And still a refusal to answer questions directly I truly wished I’d never wasted my time. Another keyboard tough guy” is really out of line. First the email recipient was never condescending, and second his article clearly answered his questions, which he was vague on up until the second to last email. So it is OK for him to take from the email recipients basket of eggs for his family, but not OK for the recipient to defend his time and expertise? Wow, frankly what a selfish jerk!!!! QUOTE: “What is sad, is the uninformed anecdotal reviews (such as at Amazon) that permeate the Internet condemning this filter for what is actually a positive. As noted earlier this filter is so efficient, that it can clog easily; this is NOT a flaw, rather users simply should be aware of this and maintain this filter accordingly and add a pre-filter as recommended by aquarium professionals! It is noteworthy that there is NO PROBLEM with the leveling feet, rather it is the lack of use of a pre-filter as previously noted that can cause this filter to leak out the back due to clogging. Unfortunately Amazon has “no skin in the game”, provides no service or scientific knowledge to the products they sell and most importantly since they have no knowledge of how the Rena Smart Filter should be properly set up, do NOT sell this product with the correct pre-filter. Resulting in the irresponsible and incorrect reviews. Please note, my friend who forwarded this email has asked me not to link to the email recipients web page or name. One; you should not be purchasing from Amazon or any of the disguised aquarium/pond supply retailers such as My Fish Place, Pet Mountain, etc. Two; you cannot believe the reviews from said places such as Amazon where by the filters were not sold with the complete products to even set up correctly (also in part why the lower price). This is analogous to purchasing a Ford without a transmission and then stating their cars/trucks do not work correctly. Unfortunately many Amazon Aquarium products reviews do JUST THIS such as with the Smart Filter! *An interesting blog about alleged dishonest Amazon business practices, I found this an EXCELLENT MUST READ!! The author seems to show certain biases that get in the way of the truths about this product, which I personally have found to be the BEST LED fixture I have used to date. However before I come off and seem to attack the author, which would be wrong, let me address the points he makes and the errors there in. *First TMC has patent rights with Cree and whether or not TMC added this name of “Ocean White”, I cannot say, but what I do know is this is NOT a cool white emitter. In fact it is not from the same emitter bins since TMC has patent rights to specific tweaks if you will with emitter bins such as the XT-E used here. This is nothing new, as companies that hold patents have done this for eons. *He is also incorrect as per the Royal Blue, as TMC has been using a Royal Blue emitter for a few years, while the Fiji Blue is different with a lower nanometer range and lower peak nanometer of 450nm, unlike the royal blue at 465. *Finally, the “Nature Perfect” Osram Oslon emitter is the name simply given by this new specifically reef developed emitter. It is NOT even a deep blue emitter rather a full spectrum blue developed specifically for reef aquariums. Here is the spectrum, DOES THIS LOOK LIKE A DEEP BLUE TO YOU?? Hopefully reef keepers looking for one of the best LEDs on the market, especially when price is considered will look at the facts first, as this clearly is one of the best, if not THE best LED fixtures available as of 2013. Tragically, when it comes to Aquarium LED Lighting, much of what is passed around as facts nowadays is anything but. As well many companies such as Reef Central are sponsored (bribed if you will), yet will attack me or others on a personal level when facts are presented stating my recommendations do not count as I or others might have a bias, which the obvious response is YES! However, these others who actually promote inferior LEDs at least when it comes to energy consumed per PUR light output such as the EcoTech clearly have a bias, and one based on promoting their sponsors. So in the end, whether you take my word or others in my profession whose careers and livelyhood is based on using what truly works or not, I certainly can understand “why not” with all the confusion and often conflicting information. WHAT READERS SHOULD DO, is actually look at the facts, as I presented here and in many other posts, not the hype, not PAR readings when PUR is more important. The answers do not take a rocket scientist to decipher, so if you open your mind and look past the many reef forums and websites that do not use known science to prove their points, rather often attack others who provide facts with comments such as “they are not credible as they use or sell this product”, you will find that the answers for the best LEDs to use is actually quite easy.